Congratulations to "Jane", the winner of Dana's giveaway. Thank you to all who participated! Writing Dangerous Embrace, with two completely opposite characters, was an interesting challenge. Most writers will agree when I say, once you craft a character, they take on a life of their own. That was certainly true with these two. To my surprise, the character with the personality most like mine was the hardest to write. Sarah’s head was a difficult space to get into. It sounds crazy, but she was so well guarded even in the stage of creation that I couldn’t get her right without an intense amount of work. The same held true in the editing stage, and it was at that time that I realized I had to let my own guard down to really see her and what she needed. While many of Sarah’s personality quirks (ahem, read flaws) came from me, that’s where the similarities end. In my wildest dreams, I couldn’t imagine enduring what she’s overcome, which just created another challenge for me. I needed to make her strong, yet vulnerable enough to need Mark’s help and love. She was worth the challenge and I hope you all like her. Mark on the other hand, the family man and all around nice guy, was easier to understand. I’m sure that has to do with my own imagination and the way I’d want my hero to be. All of us can draw a picture of the perfect hero. We all know what we want when we’re being scooped-up and taken care of, even when we’ve convinced ourselves the LAST thing we need is to be cared for. Unlike Sarah, Mark has lived in the same town his entire life. His parents are still married. He’s had a very ‘normal’ upbringing, and he has a pretty positive outlook on life. Something Sarah has trouble relating too. When Mark discovers Sarah, in need of help, yet so unwilling to accept it, he’s not sure how to handle her. But he’s sure he wants too, and he knows he needs to. Dangerous Embrace is the first in a series of books based in Northern California. All three books address second chances and learning to not take life for granted. In the next two stories, Precious Embrace and Anew Embrace, you’ll get glimpses of Mark and Sarah as secondary characters. When she exited the freeway in Santa Rosa, she drove through town toward her house instead of his. “I have to pick something up at my house.” She felt calmer now. The few moments of silence gave her a chance to plan. “This won’t take long. You can wait here if you want.” She jumped out of the car and ran into the house. Sarah rushed to her closet, but then turned and paced, her agitation growing with every turn of the room. She had to leave. Kevin would kill her when he found her; it was there in his eyes. She wasn’t in any doubt about this fact. She stopped pacing and stared down at her engagement ring, and at the same time, tears dropped from her eyes. One way or another, she was going to lose everything. She stared at the floor, unable to respond. What else could she do? It wasn’t just her life to lose this time. Mark, Jamie, they were both in danger now too. He’d kill them just like he killed Charlie. If she left, Kevin would come after her and Mark would be safe. She could hide again. She’d managed to hide from him until now, and she could do it again. Dana is giving away a paperback signed copy of Dangerous Embrace to one lucky commenter. You can find the e-book version of Dangerous Embrace on Amazon now with the special publisher’s price of $0.99 until January 1st. Regular price is $3.99. Giveaway ends 11:59pm EST Dec. 28th. Please supply your email in the post. You may use spaces or full text for security. (ex. jsmith at gmail dot com) If you do not wish to supply your email, or have trouble posting, please email maureen@justromanticsuspense.com with a subject title of JRS GIVEAWAY to be entered in the current giveaway. Thank you, Trish! Happy New You to you as well. This sounds like it would be a good book. I enjoy second chance stories too. Hope you had a nice holiday and a Happy New Year. Hi, BW, it was a great holiday and it's been a great vacation so far. Good luck on the giveaway! Thank you, Maibeeme! I hope you enjoy Dangerous Embrace! Happy New Year! I love meeting new (to me) authors and reading second chance romances (one can always hope!). Dangerous Embrace sounds like a great read! Thanks, Karen! Good luck on the giveaway! Thanks! I hope you like the rest of Dangerous Embrace! Good luck with the giveaway! Thanks so much for the giveaway, Dana. Looking forward to reading "Dangerous Embrace." Thanks for stopping by to say hello, Jane. Good luck with the giveaway! 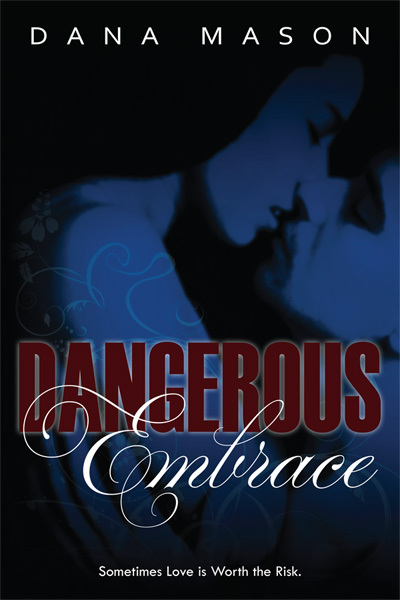 I do not believe that I have gotten my hands on this series yet... thank you so much for sharing a bit about your book with us today and for the chance to win a copy of Dangerous Embrace! Thanks, Collen! I hope you drop back by to add your email for the giveaway. We seem to have a bit in common. I have math / science / computer whiz brothers and sons. I on the other hand... not so much. I do love the written word and have a good (sometimes too good) imagination. Ha! Yeah, those math and science geeks tend to get a little cocky when it comes to homework time. :) That's okay, they can keep their numbers and I'll stick to my words. Thanks for stopping by, Julie. Not entering... I already purchased my Kindle copy :) Just wanted to say congrats to Dana on her new release! Thanks for the great post! Oh, thanks, Erin! I hope you'll let me know how you liked Dangerous Embrace. Opposites always work very well in a story. I love it when the characters have to work hard at a relationship. Good luck with the giveaway, Mary. This book sounds really great! I like that we will see the characters again in another book. I'd love to be entered to win this one. Thanks forthe chance. Thank you, Martha. I'm a huge fan of series too. Thanks for stopping by. Great excerpt. Sounds really good. Thanks for sharing!! Thanks, Donna! Good luck with the giveaway. I love books that involve second chances. Thanks for the giveaway! Thanks for stopping by. Good luck with the giveaway. Hi Dana - this sounds like a creepy yet exciting, heart pounding read. Just what we like on this website, right? Thanks for the chance to win one of your books. I'll go check out your website to learn more about you! Hi Amy, Thanks for stopping by. I hope you'll come back and add your email so you can be entered in the giveaway. Yes, I always seem to forget my email! It is amy at remus dot net. Thanks! I do like stories about second chances. They're my favorite too. Good luck with the giveaway, Maureen. Thanks, Holly! Good luck on the giveaway! You caught my attention Dana. Everyone would like a second chance! Yes, sometimes we all need a do over. Thanks for stopping by and good luck with the giveaway.